If your calves are stuck at skinny-kid status, then you're probably making one or more of these 6 mistakes. 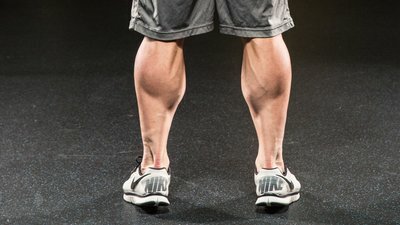 Fix common calf-training blunders and turn your calves into cows! Every trainee I know wants a set of nicely developed calves. There is often a disconnect, however, between wanting good calves and actually sporting them. Very few muscle groups can be as stubborn to grow as your calves, and a constant lack of progress might compel you to stop training your lower legs entirely and put your own calves out to pasture. However, before you throw in the towel, you should know that your calf-to-cow trouble could be the result of some easily fixed calf-training mistakes. Yes, there is hope for your lagging gastrocs! Even the skinniest calves can grow into full-blown bulls with the right approach. Here are six training errors you might be making, and the best way to fix each of them. I've also provided a calf workout that's brought me incredible results. Read on so you can properly build the burly, cut calves you've always wanted! Much like the rear delts on shoulder day, calves are often neglected—or saved for the last part of a leg workout, when you're tired and barely able to muster up the energy for a couple of half-assed sets. As you probably already know, muscles can't grow if they receive subpar training. If you really want to make your calves stand-out, you must start training them the way you train your back or chest: fresh, from every angle, and to complete exhaustion. If you can start your leg training with calves—and train them with the same intensity as you do your quads and hamstrings—do it. If you're trying to hit your upper legs super-hard and just don't have the energy to do the same to your calves on leg day, add an extra calf day into your split or add the work to a different workout. Whatever you choose, the point is to ensure that your calves don't suffer from lack of attention. This higher rep range forces you to use a slightly lighter weight, which allows you to fully contract your calves and stimulate new growth. Lots of reps will also mean an awesome pump! I see a lot of people training their calves in the exact same way at every single workout. If you only do calf exercises sitting or standing, then you're not hitting all portions of your calf muscles equally. Your calves are made up of several muscles. Your gastrocnemius is the muscle that makes up the inner and outer head of each calf. When you are doing standing calf exercises, the majority of the work is performed by the gastrocnemius muscles. The soleus, on the other hand, runs directly underneath the gastrocnemius. The soleus muscles are activated when performing calf exercises with your knees bent, like when you do a seated calf raise or calf raises without your legs locked out. Armed with this knowledge, you can select exercises that will train your entire calf, not just parts of it. When more muscles get activated, you'll see more growth. Common calf-training knowledge says you have to train calves heavy to make them grow. I completely agree! However, if you use weight that's so heavy you can't do an exercise properly, you're just robbing yourself of gains. If you use too much weight, you could start bouncing at the bottom of each rep, or fail to complete the rep with a hard contraction at the top. Too much weight might also make you get assistance from the quads and cheat the weights up. Not only does this poor form place a ridiculous amount of dynamic stress on your Achilles tendon, vertebrae, and knees, it also cheats your calves of precious stimulation. Your ankles get severely out of line with the rest of your leg during any portion of the rep.
You can't perform standing calf raises without bending your knees, or seated calf raises without using your arms to pull the weight up. You feel pain in the arch of your foot or your Achilles tendon. Just like any other muscle, your calves reap the most benefit from an exercise when it's done with a full contraction, slow negative, and a full stretch. Many people like to bounce the weight or just perform partial reps in the middle 50 percent of the range, leaving out the full squeeze at the top. In my opinion, that hard contraction at the top is where the real growth occurs. Optimize the squeeze you get at the top of each rep by getting up on the balls of your feet and pushing as high up as physically possible. Once you're at the top, flex the muscle, hard. It takes a conscious effort and mental focus. Those who have tried my arms workout can attest to the enormous difference a big squeeze at the top will make in the efficacy of your workout. The work isn't over once you've hit that peak contraction. Keep tension on the muscle while you slowly return the weight to the starting position. Taking your time throughout each rep will increase the amount of time your calves are under tension, even if you're using the same weights and reps you normally do. At the end of each rep, gently—no ballistic movements—stretch the calf as far as you can without shifting the focus of the stretch from your calf to your Achilles tendon. You want the stress to stay on the target muscle, not your connective tissue. We've all heard that pointing your toes in, out, and straight ahead will hit your calves from various angles. Much of this is true, but only to an extent. It's true that having your feet pointed straight ahead will equally train the inner and outer heads of your calves. It's also true that having your toes pointed out will shift the focus to the inner heads of your calves, and that having your toes pointed in will shift the focus to the outer heads. That being said, your toes do not need to point out or in more than an inch to change the focus. Performing calf raises with your toes at extreme angles not only prevents you from achieving maximum calf activation but also places an inordinate amount of stress on the ligaments and connective tissues in your ankles and knees. For best results, don't play around with your toe angle too much. Mix it up if you wish, but do notemploy extreme angles. An inch in or out will do just fine. Exercise Note: Last two sets are triple dropsets; use weights that cause you to fail at 10 reps. Exercise Note: Last two sets are dropsets; use weights that cause you to fail at 10 reps. Exercise Note: Perform with a slight bend in the knee so the gastrocnemius and soleus are activated.